The harried holidays are coming to an airport near you, but so are four-legged creatures such as dogs, a cat, even a genial pig, that will be roving airport terminals to de-stress passengers. Many U.S. airports have therapy pet programs. Fodor's travel guides recently gave a shout-out to a dozen that "pass the sniff test." Look for these love dispensers, many wearing "Pet Me!" vests, when you're visiting these airports. Los Angeles International Airport's therapy pet program called PUPs, or Pets Unstressing Passengers, started in 2013 with just 20 dogs. Canines cuddled their way through airport terminals, making the program a success and one used as a model by many other airports. Today 93 dogs and their owners spread the love at LAX's gate areas at each terminal's departures levels. If you're lucky, you'll find them dressed up for events such as the annual Howling Halloween Parade. Look for Instagram (flylaxairport) and Facebook (@lainternationalairport) posts to learn when the pups are in the building. San Francisco International Airport's Wag Brigade also started in 2013 with therapy dogs trained by the city's Society for the Prevention of Cruelty to Animals, or SPCA. Three years later a pet pig named LiLou - sometimes sporting a tutu and hair bow - passed the test and joined the "Pet Me!" squad. Last year the pig greeted one of the most famous animal lovers on the planet, Jane Goodall, at SFO. "I knelt down to greet LiLou ... and enjoyed a snout-to-nose greeting," Goodall wrote on her blog. Wag Brigade animals can be found at the airport on Mondays through Fridays. Follow the team's Instagram feed (SFOWagBrigade) to find out what they're up to. How's this for confusing: The 115 therapy animals that participate in CATS, or Canine Airport Therapy Squad, at Denver International Airport (DIA) are dogs. But there's also a short-hair cat in the program. If you're at the airport at the right time, you are most likely to see Newfoundlands, golden retrievers, Labradors, German shepherds and standard poodles. There's no set schedule when the CATS crew makes the rounds, but the airport posts their whereabouts every day on Twitter (@DENAirport). 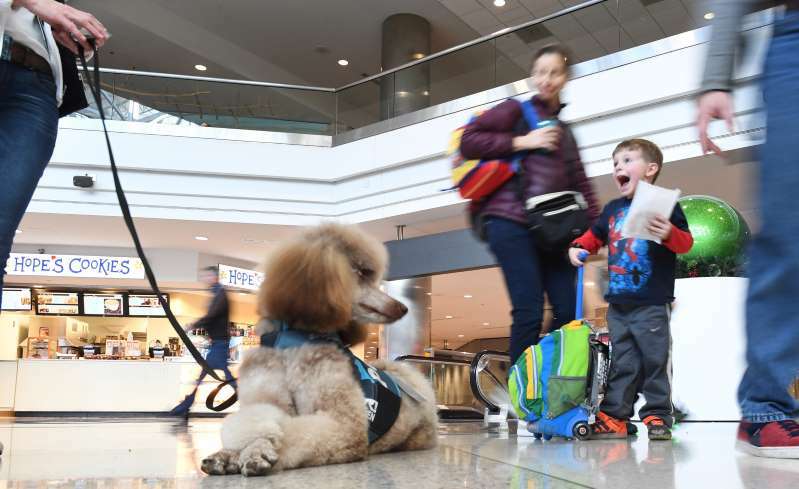 Vancouver International Airport (YVR) sends seven Ambassador Dogs out to greet passengers at the airport's terminals from 11 a.m. to 1 p.m. weekdays. Known as the Less Airport Stress Initiative, the therapy dogs (and their owners) wait for passengers to pet them and love them up. However, these aren't the only creatures at the airport. You can bliss out watching sea nettle jellyfish float around in the International Terminal's aquarium. Just don't miss your flight.